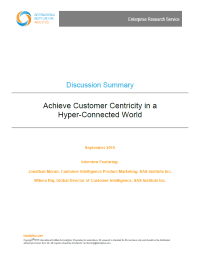 Download this insightful-filled interview between the International Institute for Analytics and SAS Institute experts on customer intelligence to learn how technology can help create a truly customer-centric business that make all the right connections between the customer and brand. Improved customer experience is the brass ring of enterprise businesses, but often achieving a true customer-focus is one that eludes them due to fragmentation and complexity around customer data and processes. Meanwhile, customers have become more connected and empowered than ever before. Brands face a wide variety of options in trying to gauge how to best interact with their customers, all of whom have more control and are more discriminating. To win, marketing and IT are working together to leverage data and analytics to thrive in this hyper-connected world.